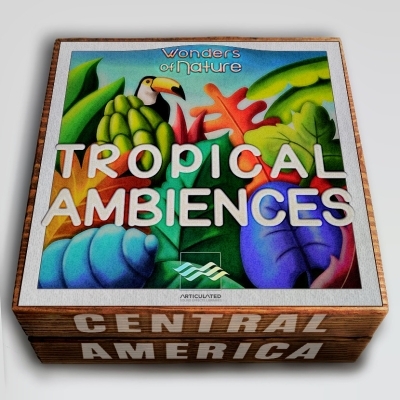 "Tropical Ambiences" (from the "Wonders of Nature" series) is a collection of 52 pure immersive sound media recorded in a wild, primeval nature. These unique records were carefully collected in each subgroup of tropical ecosystems in the most biologically diverse parts of Central America. It includes rainforests (jungles), cloud forests, dry forests, mangrove forests and various others. This sound set, recorded at different times of the day and covering a wide range of weather conditions with varying scales of rain and wind exposure, provides access to the entire spectrum of wild tropical sound landscapes. Each of the 52 files is a set of 1 to 4 minutes of high-quality sounding such an environment.